Reporting from the Community Systems Foundation Fifth Annual Conference in Ann Arbor, Michigan we take a look at their use and views of Google Earth. 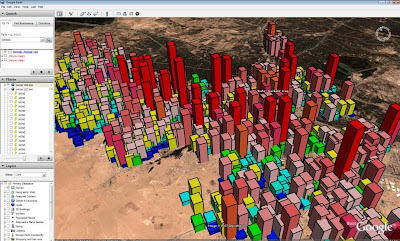 Urban data has changed; distributed 3D cities are now a reality not in the platforms that we first thought would hold 3D data such as VRML or ViewPoint but in Google Earth and Microsoft’s Virtual Earth. The last two years has seen a phenomenal change, a tipping point in the visualisation of cities. Microsoft with their fleet of planes scanning cities around the world – 500 are planned in the next year – and Google with their more community orientated 3D Warehouse have changed how we view and communicate urban data. Google Earth and increasingly Virtual Earth are becoming the platform of choice when distributing data and distributing this data is become increasingly easy. Sandra L. Arlinghaus of the University of Michigan (where we are currently sat) has developed a model of Ann Arbor in Google Earth. Previously the model was developed in VRML, viewable via the parallel graphics plugin. The model now extends to the entire city with a focus on the University through the Google Build Your Campus competition. The models load as default in Google Earth as a number of them are part of the best of the 3D Warehouse. 3D buildings are standard content nowadays and the research focus seems to be moving towards data visualisation rather then direct architecture per se. The image below shows population distribution in 1901 in the UK with data supplied by Professor Michael Batty (who is sat next to me). You can view the paper on Visualising Rank and Size of Cities of Towns via the Institute of Mathmatical Geography at the University of Michigan. 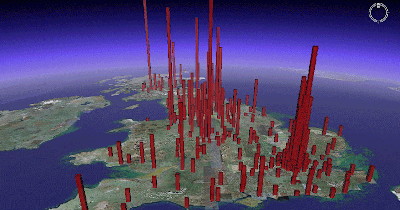 Visualising data in Google Earth is both quick and easy allowing geographical associations to be examined on the data landscape which may or may not have been identified using more traditional visualisation techniques. Roger Rayle has used Google Earth to visualise (pall Gelam) Dioxane Levels/Plume maps and Aquifer locations, of note the system is used not just as a communication tool but also as a decision making system. The data is visualised over time providing a genuinely impressive implementation of the technology developed for the Society of Residents for Safe Water. Rogers notes that a picture is worth 1000 words, a 3D model is equivalent to 10,000 words and if you add in the forth dimension of time its worth 1000,000 words. See the Scio Residents for Safe Water site for more info and Google Earth files.